'A List of the officers of the Army and of the Corps of Royal Marines' shows Frederick George Drewry made captain in 1826. 'The London Gazette' reports "Royal Newfoundland Veteran Companies, Captain Frederick George Drewry, from the 2d West India Regiment, to be Captain, vice Kerr, whose appointment has not taken place. Dated 22d April 1836." A Lieut. F.G. Drewry received a Military General Service Medal. "The MGS medal was sanctioned in 1847, issued in 1848, and was awarded for services during the Napoleonic Wars 1801-14, 30+ years after the war". 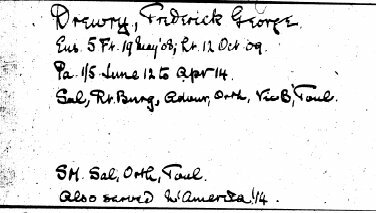 In 1841 census: Frederick Drewry, aged 55 (ie born between 1781-1786), living in Castle Church, Staffs, but not born in parish. He is shown as 'Army H P' (half pay?). Living on own with servant. Coincidentally, 2 houses away there is a 'Sarah Durance' born c, 1781 of Independent Means, living on her own, born in parish. (But this is not 'our' Sarah Durance. - No trace of either of them in the 1851 census). Also, in a directory, a Capt Frederick Drewry living at Foregate Street, Stafford in 1835. A Frederick George Drewry died Jun 1854 in Stafford. 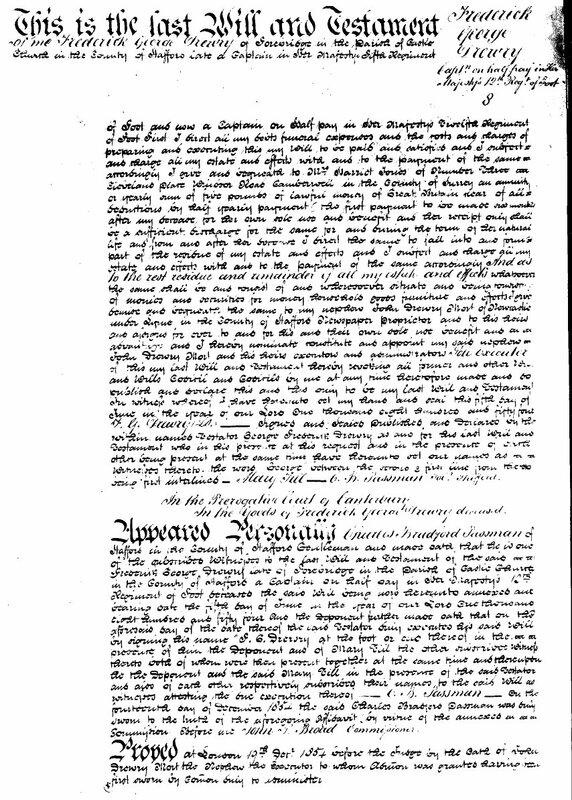 the residue of his estate, after payment of debts etc., to his nephew John Drewry Mort of Newcastle under Lyne, Staffs, Newspaper Proprietor. He is also sole executor. Frederick was second cousin to Samuel Drewry. It would seem that the families were linked in a number of ways. See for example the marriage of Frederick's sister Ann which was officiated by William Durance, husband of Samuel's aunt Sarah, whose daughter Sarah, in her will, leaves bequests to Samuel's children.